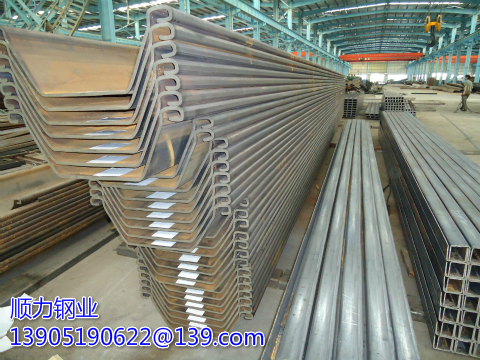 The longitudinal inclination of the steel sheet piles is caused by the friction between the plunged pile and the pile being hit, or due to the improper use of the pile hammer. If it is found that it should be corrected immediately, it may cause the slant to be out of control. Need to pull out the tilt of the pile, then you can use the screen style to reduce the way into the step-by-step tilt of the wind when the root piling when the tilt close to the allowable limit to stop piling at this time to use the screen-type piling method to eliminate further Of the tilt, against the piling direction from the vertical degree to meet the requirements of the pile back to the inclined pile. In combination with the above method, the inclined pile can be pulled back by means of a wire rope and the position of the pile hammer can be shifted from the center of the pile to the already hit pile. When the pile can not be removed, the pile can not be removed or replaced. Can be used to solve the model pile. Tilt correction When you hit the first pile, you need to be careful to ensure that its verticalness and pile position are within the allowable error range. In order to avoid the slab pile, pile hammer should be located in the piling center of gravity, through the chuck firmly and vertically grip steel sheet pile. When the pile is set up, the top of the pile should be flat, the hammer force through the hammer anvil and pile pad evenly spread to the pile section guide purlin can effectively eliminate the lateral tilt of the sheet pile, Correct, you can pull out the pile to control the lateral tilt. The dense, non-cohesive soil is usually loosened before the pile is pre-drilled along the pile. Pre-drilling is beneficial to impact, vibration piling and hydrostatic pile construction. Mounted on the telescopic rod, and can easily drill out of the hole deep nm, telescopic rod can also be installed piling equipment using twist drill when the soil should not be removed and leave the hole loose in the cohesive soil under the cohesive soil This may happen when this happens. Pile must be filled with any soil in the soil, the lower column of the steel sheet pile wall to avoid the use of pre-drilling: wall passive area, close to the bottom of the pile and encountered confined water.